Everything about the Brett Kavanaugh confirmation fight is discomfiting for Senate Republicans. The GOP is on the brink of a midterm election that can only give control of the Senate back to Democrats if something strange happens … and the Kavanaugh saga is becoming very strange. At a time when GOP candidates want to talk about the economy or tax cuts or (maybe) immigration, the public discourse is being submerged in a murky but emotionally powerful set of arguments over the sexual abuse of women in the past and present. The dubious standing of a Republican president and his party with women is being tested once again. And divisions in the Senate Republican Conference are threatening a goal of supreme importance to conservatives. Last year a small handful of Senate GOP rebels prevented their party from bringing down the white whale of Obamacare; this year, some of the same senators threaten to prevent the reshaping of the Supreme Court and the rescission of rights not recognized by conservatives, most notably the right to choose abortion. 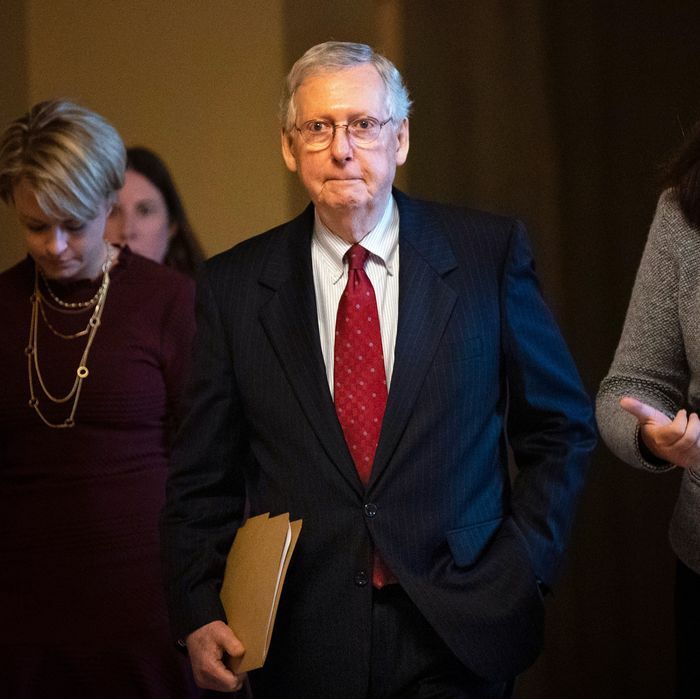 In the middle of this maelstrom stands the taciturn tactician Mitch McConnell, whose primary objective now and forever is to keep power in his and his party’s hands. He has exactly seven weeks to do everything within his power to maintain a Republican Senate majority. He must deal with fearful GOP candidates; the last two pro-choice members of Congress (who happen to be women); the most tempestuous president of the United States since Andrew Johnson; the sensitivities of an octogenarian Judiciary Committee chairman; and a conservative “base” whose media representatives are turning the Kavanaugh battle into a holy war and a crucial test of GOP strength. This commitment was made in the midst of a fiery speech in which the normally laconic Kentuckian echoed the outraged rhetoric of conservatives deploring the “shameful smear campaign” against Kavanaugh. And so McConnell added his own voice to those of the right-wing media and Kavanaugh himself in holding that a tactical retreat on this confirmation is not on the table, even if there are people in the White House and elsewhere whispering to Donald Trump to dump this loser nominee to preempt a defeat that could make POTUS look weak. Is it possible that McConnell knows something the rest of us don’t know about what will happen in the Judiciary Committee and on the Senate floor, even before the intensely high drama of Thursday’s hearings? Maybe, but nobody else seems sure that current GOP holdouts Jeff Flake (a lame duck who has no particular reason to fear McConnell or Trump at this point in his life), Susan Collins (who is under intense pressure back home to oppose Kavanaugh), and Lisa Murkowski (who has bucked McConnell before) will, in the end, come along. In fact, there are a total of eight Republican senators who are publicly undeclared on the confirmation. So is McConnell simply gambling on victory? That’s possible as well, but it’s more likely he has decided that a defeat for Kavanaugh on the Senate floor is preferable to withdrawal of the nomination or a delay in the vote. Even if Kavanaugh “loses” in the Judiciary Committee, his confirmation can and would be forwarded to the full Senate without a recommendation. As noted above, a withdrawal, even if Trump went along with it, would risk a cry of betrayal from Kavanaugh himself, which conservative media and activists would take up loudly, with potentially dire consequences for midterm turnout patterns. A defeat, however, could be blamed on evil partisan Democrats and RINO wimps who are not on the ballot this year. Kavanaugh’s bloody shirt could be waved in campaigns to defeat vulnerable red-state Democratic senators like Heidi Heitkamp and Joe Donnelly. And Trump would still have roughly a month before the midterms to pick another SCOTUS nominee from his pre-vetted list, and begin a campaign to secure her or his confirmation during a lame-duck session or in January (depending on who wins in November). It’s just a matter of making the best of a bad situation. So what may ostensibly look like Mitch McConnell taking a brave and principled stand regardless of the consequences is most likely just another calibrated roll of loaded dice.